Wow...your shelves and collections are wonderful. I would love to see your house in real....I would be squealing with delight! Oh my! I love all of your treasures and your studio is fabulous! Simply gorgeous. And what a lovely workspace too. Holy Cow! You have beautiful collections! Wow! Who dusts it all? That would be some job! I'm your newest follower. Found you via Kim's blog. I love your style...I like to decorate with lots of things too and have several collections. Your displays and vignettes are each gorgeous, so is your cabinet full of your creations. Absolutely gorgeous, gorgeous, gorgeous! I love that shot of the window looking out to the ocean! Love your house and of course, always, the books!!! I adored looking through your fabulous collections.You certainly have a knack for arranging things. One should rent your services! love the old bird cages on top of your cabinets! Thank you so much for coming to my Kiychen Favourites party. I'm so glad you decided to link up because I haven't been to your lovely blog before. I LOVE all your shelves and collection. They're gorgeous!! The cabinet full of pink and blue is FABULOUS! I love all your collections but that picture took my breath away. Thanks for sharing at the Open House party this week. Wow! What an inspiration you are!! 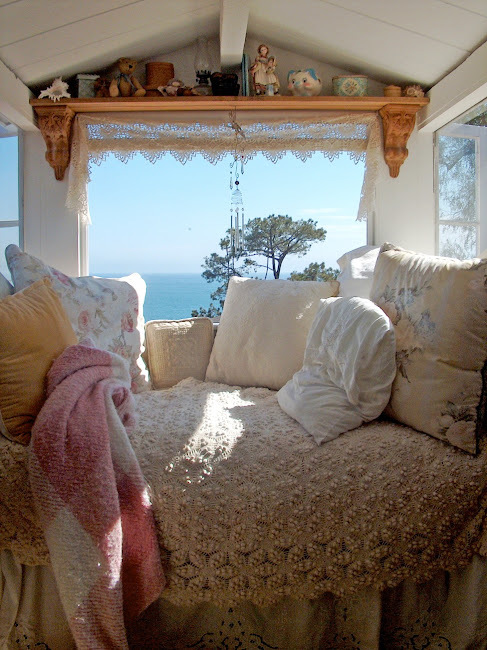 The room upstairs by the window with the ocean breeze is one of my favorite spots in your house! Oh it's precious! Do you teach your ceramic methods??? I ADORE all your beauties of the sea!